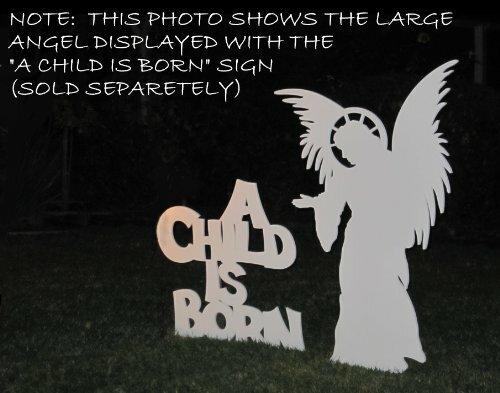 Beautiful angel silhouette for your outdoor nativity scene, gesturing toward the baby. -Beautifully detailed nativity angel. -Made of the same high end marine grade, PVC material all MyNativity sets are made from. I spent a lot of time researching PVC sheets and believe me; they are not all the same. Angel comes with clips that can be attached to 1/2" re-bar or a stake (not included) to secure her to the ground. You can pick re-bar or stake up cheaply at a local hardware store. (they are heavy and cost too much to ship.) I couldn't really tell you where the inspiration came from, but I can tell you that she was absolutely inspired. I've never had a design come so quickly and easily. She was my addition to the set in 2011. When I sat down to draw a nativity angel, I had in mind that I was going to draw a male angel with no wings, blowing a trumpet. I was planning on something like the angel on the top of most Mormon temples. But in less than 2 hours, I had drawn a female angel, with beautiful big wings, leaning slightly forward gesturing to the baby. It is so much softer and peaceful. I'm a little embarrassed that I didn't know she was the angel my nativity needed. But thankfully, my pencil did. She just quite literally, drew herself. It was a wonderful experience and she is the perfect addition to the nativity.. The Lifesize angel is cut from 16mm PVC, and measures 46" wide x 78" tall.